You`re probably looking for the best way to help keep your car, truck or RV cool and probably don’t want to toil through loads of products and research to find out what might be useful. Fortunately, a portable air conditioner can be your simple solution to this problem and in this article, we have you covered whichever point in the buying process you are. Whether you want the best portable air conditioner for your car right now, want to learn about what you need to look for or just want to find out more about car air-conditioners and fans, click on one of the below links to get you started. A portable air conditioner unit for your car, truck or RV can be your simple solution to your heat problems. With a good portable AC you can better control the temperature in the vehicle and create a much more comfortable environment and enjoy driving even in extremely hot conditions. You can use a portable AC if your vehicle’s air conditioner is unreliable and malfunctions frequently. On top of it all, some portable air conditioners not only cool the air but also dehumidify it, which improves the quality of air in your vehicle. 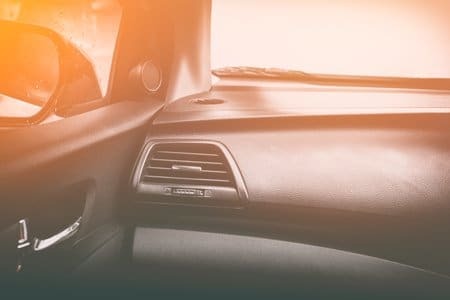 Now that you know the reason why you might want to get a portable AC for your vehicle, you must get familiar with the types of such air conditioners on the market. Here are the three types of portable AC and fans for vehicles and a brief overview of each of them. A fan cooler is the most affordable option when it comes to choosing a heat solution for a vehicle. These are not really AC systems but they do get the job done when necessary. Fan coolers in vehicles are easy to use and install and most of them are very energy efficient. They are a great option for a small air conditioner for your car as you can direct the air manually to the desired direction and stop the heat from building up. 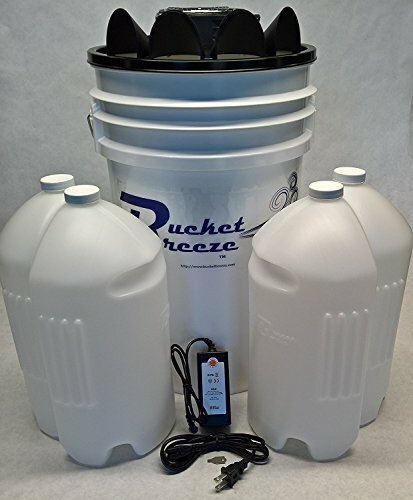 Bucket vehicle coolers are a bit bulkier than the previous type but they can cool your vehicle very efficiently. You don’t need to keep your car or RV running in order to stay cool. You can simply use a bucket cooler that can either be battery charged or powered through the cigarette lighter outlet every vehicle has. You simply need to fill up the cooler with water and ice and turn it on to get a fresh and cool breeze. Last but not least, the rooftop air conditioners for RVs are the most expensive but also the most effective solution. It distributes the air evenly through the vehicle and provides extra cooling, turning your RV into the most comfortable spot during the hot summer days. On top of that, these AC systems feature a sleek and contemporary design, which makes them a great addition to your vehicle. The first fan cooler on our list is the AboveTek 12 volt portable air conditioner DC model, which features a rotatable blade with two-speed options. This strong-operating fan cooler comes with a nine feet cord so it can be placed anywhere in the vehicle. Even though it is most commonly placed on the dashboard, it can be placed on the armrest area as well, thanks to the secure adhesive sticker on the bottom. This fan cooler is made of premium quality materials including ABS plastic. It features a 360 degrees rotation design, meaning you can direct the airflow wherever you want. Furthermore, the airflow can be customized with the two-speed levels provided by a strong motor. Besides keeping you cool while driving, this efficient yet affordable device can prevent the heat from building up while the vehicle is parked. Its power consumption goes from 8w to 15w while the required power is a 12V DC cigarette lighter socket. The strong motor operates quietly and effectively removes any smells or smoke in the vehicle while keeping the air comfortable and improving its quality and circulation. In case of any malfunctions of the device, you can contact their customer support service for refunds or exchanges. 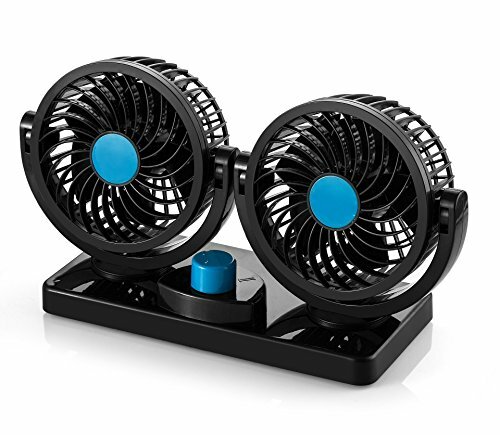 The next fan cooler for vehicles we recommend is the one from Taotuo, a car cooling fan that features adjustable speed and a cage shape for increased efficiency. The shape and design of this fan ensure cooler air with two adjustable speeds: high and low. The silent vent operates on the input power of 12V DC and consumes about 7 watts of power on average. Therefore, it is a very energy efficient solution for the heat of the summer days. Besides low energy consumption, this high-quality fan cooler has a very low noise level of less than 45 dB. The two speeds can be adjusted on a control panel that features three switches; high, low and off rotating switch. As a very effective portable AC solution, this fan is also very simple to install on your vehicle’s dashboard. It comes with a five feet long cord, meaning you can freely move the fan around while still having it plugged into the cigarette lighter outlet, which is the power source of the fan. Overall, even though it is not a full air conditioner system, this fan can be a lifesaver when you’re stuck in traffic during the summer heats. 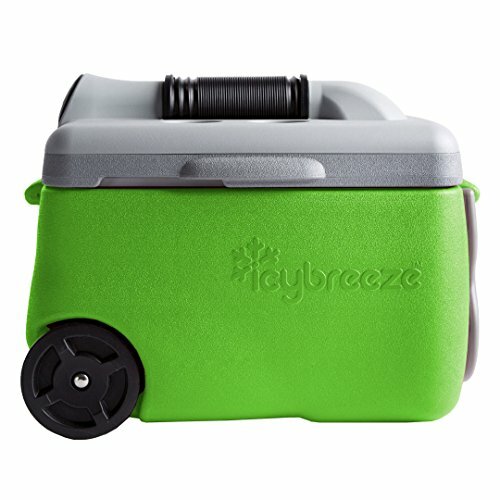 With the IcyBreeze bucket vehicle cooler, you can choose from several different power source options, including the standard 110 V wall charger, a 110 V continuous power supply transformer or the 12 V car power supply cord that needs to be plugged into the cigarette lighter socket, which is the option you need in this case. Besides, this device can also be battery powered for mobile use. All these options make the IcyBreeze portable air conditioner the perfect solution for vehicles. It is able to cool down space and create a comfortable environment around you, no matter how hot it is outside. For the cooler to do its job, it needs to be fully charged or plugged into a power source. All you have to do is fill it with water and ice, turn it on and let it do the job. You can direct the air through a flexi-hose or let the breeze come out of the integrated vent. With three available speed options, this cooler can blow air at the speed of 25 MPH. Most importantly, even though it is highly powerful and cools your vehicle efficiently, it is still an energy efficient solution. Our second choice for the bucket vehicle coolers is the model from Bucket Breeze, designed to provide cool air and improve the environment around you. What’s great about this cooler is that it can provide both cool and warm breeze, depending on your needs in a specific situation. The product includes a multi-voltage power supply and features speed control and adjustment systems. It uses gel based refrigerants to provide the cool air blown by a 175 CFM fan. With the cooler, you will receive 6 bottles of high-quality refrigerant, which can last seven to ten hours. The device also comes with a battery pack for portability. The way this 12 V powered bucket cooler works is simple. If you need cool air, you will fill the bucket with the cold refrigerant and turn the fan on. On the other hand, for a warmer breeze, you can use the Terracotta Style Hot Pot, which produces heat with candles or canned natural fuel. Overall, it is a greatly efficient yet affordable AC solution. As we’ve already mentioned, the rooftop RV AC systems are the most expensive but most effective solution for the hot summer days. The first Dometic model we recommend is one of the best AC systems in the industry, operating stronger yet quieter than ever. This model is significantly improved compared to their previous models, with a 15% increased airflow and cooling capacity. Made of hi-tech, high-quality materials, we can surely say that this Dometic cooler is taking a step further in the world of RV AC systems. With the power of 13 500 BTU generated by a powerful motor accompanied by a strong fan, this AC can create a comfortable, cool atmosphere in any vehicle. It is easy to install and maintain as well. Made of durable materials, you don’t have to expect it to malfunction anytime soon. The design of the product is sleek and compact, with the addition of dampening brackets that reduce noise and vibration levels. The voltage required for this AC system is 110 V. All together, we definitely recommend it as one of the best rooftop RV air condition systems. 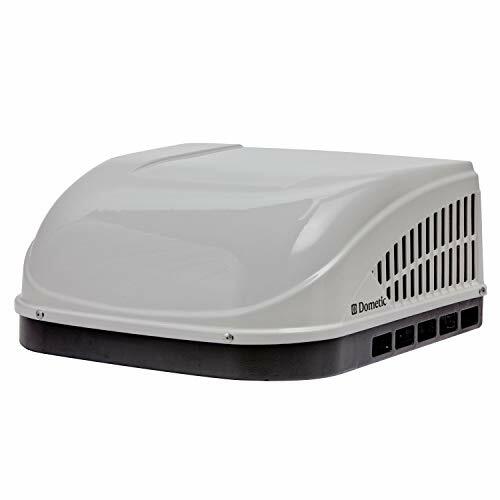 Our second recommendation when it comes to rooftop coolers is another model from Dometic, only this one features a low profile design that doesn’t slow the vehicle down and increase fuel consumption. 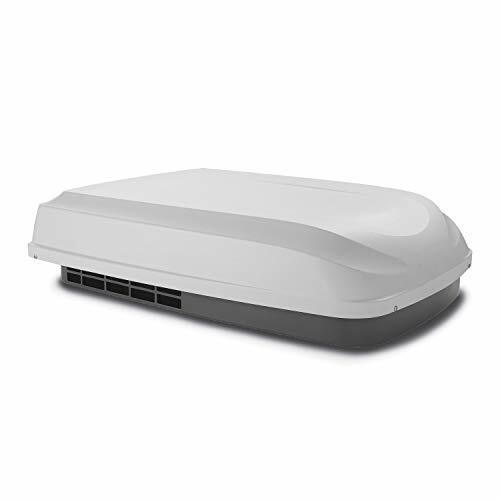 The polar white body of the cooler features a sleek, contemporary design that is less than ten inches high, which makes this rooftop cooler the lowest one available on the market. With the power of 13 500 BTU and more advanced features, this cooler provides outstanding performance and creates an amazing comfort zone, no matter the temperature outside. The cooler uses the R410 refrigerant that releases heat more effectively and creates a cooler environment. This rooftop cooler fits standard 14” x 14” roof openings. It is suitable for both ducted and non-ducted cooling systems, as it is a very strong and durable device. Another interesting fact is that this air cooler is compatible with the Dometic Air Distribution Kit and the Dometic Control Kit, which are both sold separately. Moreover, with the purchase of this AC system, you will get a two-year warranty for all malfunctions. This sleek and modernly designed device will not only help cool down your RV but also improve its appearance! Before making any type of purchase, it is important to do some research to get familiar with what the market offers and what exactly to look for in the desired product. Luckily for you, you don’t have to spend hours researching because we have done that for you! What you should know before getting an AC cooler for your car depends on what type of cooling system you’re looking for. If you remember, we said there are three types of AC systems for cars: fan coolers, bucket coolers, and rooftop coolers. Let’s say you haven’t made up your mind yet on which cooler you want to purchase. Here are the key points you should be paying attention to when looking for the right air conditioner for your car or RV. We’ve already said that the cheapest solution to the heat issue in a vehicle is a fan cooler. If you want more features and more efficiency, naturally, you will have to spend more money. For that extra money, you can get a high-quality rooftop AC system, which is considered to be the advanced alternative to integrated vehicle air conditioners. 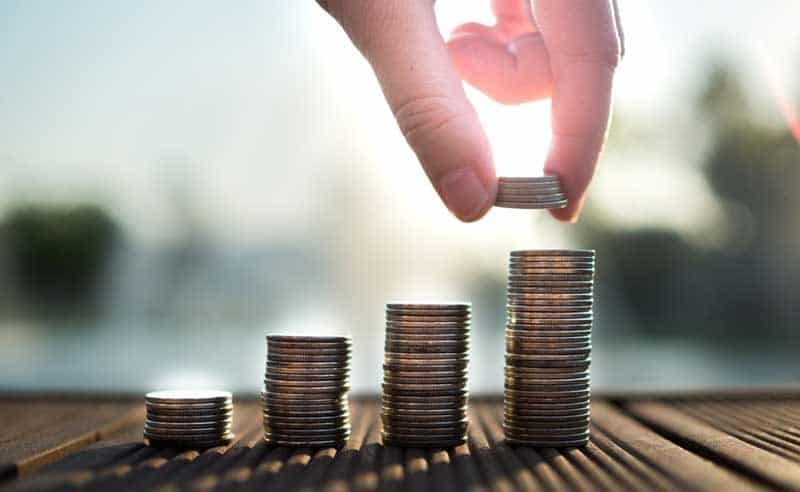 Now, there is a significant difference in the prices of the three types of coolers, so make sure to set your budget and look for a product that is within that limit. However, keep in mind that besides having to fit the budget, you must consider the fact that the price of a product is the mirror of its features. If you want more features, you will have to spend more bucks. As the title suggests, we are reviewing the best PORTABLE air conditioners for vehicles, but the thing is, even though they are portable some of these AC solutions are quite bulky. The size of the air conditioner device is important for three reasons: efficiency, appearance, space. For starters, no matter what kind of AC you get, it won’t cool efficiently if it is too small of the size of the vehicle. For example, a small fan cooler won’t do much in a bigger RV. Therefore, you must ensure that the size of the cooler is compatible with the size of the vehicle. Secondly, fan or bucket coolers impact the appearance of your car’s interior. If that is something you care about, you should consider getting a less bulky cooler but you still have to make sure it will operate efficiently. Last but not least, these coolers can take up lots of space. The rooftop ones take the least amount of space because, well, you won’t be sitting on the rooftop of your vehicle (probably). Fan coolers take a bit more space on the dashboard while the bucket ones take the most space. Have that in mind when making your decision! Most vehicle AC coolers are powered by the cigarette lighter socket but some of them are also battery charged. Make sure to check these specifications before making a purchase, as well as the amount of energy the cooler uses. In some cases having a mobile, battery-operated cooler comes in handy but when the battery is out you’re in trouble. On the other hand, lighter socket powered ones can run all the time but their mobility is restricted to the size of the cord they come with. There’s not much to say this here but the fact that every cooler is going to make some noise. However, some are quieter than others. Depending on the shape and design, the noise and vibration levels differ. Make sure to check whether the cooler is too noisy before making a purchase, as that tends to get annoying after a few hours. Definitely, the easiest to install when it comes to air conditioners in vehicles is the fan cooler. Simple use the adhesive sticker on the bottom and place it onto the desired location, which is most commonly the dashboard. Rooftop coolers, on the other hand, will require a more advanced installation but that comes easy with the included instruction manual. If you don’t feel like bothering with this process, a fan cooler is the solution for you. The features that come with vehicle ACs differ from model to model. The most common ones include speed control, airflow direction control, dehumidification and special design for efficiency. These are a few basic features that you should be getting, no matter which cooler type you choose. If the product you’re interested in doesn’t have some of these features, maybe it’s best to move on and look for another one. An important aspect to consider is how powerful the cooler actually is. The most powerful of the three types is the rooftop AC, with the average power of 13 500 BTU. There are some less powerful models out there but we don’t recommend going lower than the average number. In terms of fan and bucket coolers, you can still get a pretty good amount of power, just make sure to check the specifications before purchasing. Each product is going to require some sort of maintenance, from cleaning to fixing possible issues. As the fan cooler is the simplest solution, it is the easiest one to maintain. However, most of these products come with one or two years long warranties. Make sure to look for the ones that include full maintenance warranties, just to make it easier for yourself later on. If you’re still not sure which AC cooler to go for, a good strategy is to rely on brand loyalty. Sometimes it is easier to look for the most trusted brands on the market and choose the best thing they have in offer. If many people are praising the quality of the product, it is definitely worth considering! We have already covered everything there is to cover when it comes to alternative air conditioner solutions for vehicles. In terms of how to use these devices, the fan and bucket coolers are very easy to figure out. However, the rooftop ones may be a bit complicated, so here is a video lesson you can check out to better understand these AC systems! #1 How much does a rooftop air conditioner cost? One of the most frequent questions is always the cost of the product. In this case, the amount of money you are going to pay depends on the size, power and features the rooftop cooler provides. However, if we look at it broadly, the price range of rooftop air conditioners goes from 200$ all the way up to 1000$. Besides the fixed price, consider the ongoing costs each product may have, such as cleaning and maintenance. #2 How many watts does a rooftop AC use? The number of watts the cooler uses also depends on its size. As we’ve already explained, the average rooftop cooler has the power of 13 500 BTU and it uses from 1500 to 2000 watts. To help you get a better understanding of this energy consumption, we can compare it to other items in your RV. For example, an average fridge would consume 600 watts, a hair dryer 1900 watts while a portable fan only 120 watts. #3 How do RV rooftop air conditioners work? Obviously, it is placed on the rooftop of the RV, which is a location that allows efficient air cooling. What you probably didn’t know is that rooftop air conditioners don’t actually cool the air down by blowing cool air but they take the heat out and create a cooler atmosphere. And yes, they do that very effectively. An RV rooftop AC consists of a compressor, condenser, evaporator, an air moving system, that is, two fans and a liquid for cooling as well. All these pieces are smartly connected with wires and plugged into a generator with a 120V socket. Some RV coolers use solar power as the main energy source, which is a great eco-friendly solution. We hope you found this guide useful. While we are on the topic of air conditioners, why not check out our mega list of alternatives to air conditioners for your home. Actually, I personally think that if we have more than 1800CC car, we do not need any extra AC. But if the car is less than 1800CC we will now require extra AC because the roads out there always remain traffic jammed in big cities that will cause air suffocation or heat stroke within the car in summers. 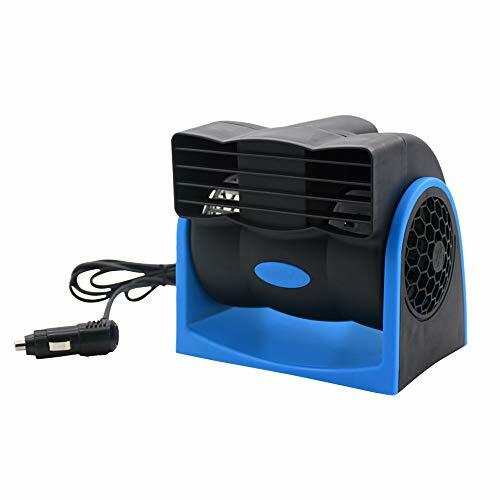 Portable air conditioners are today getting popular among people as these are portable, easy-to-carry, easy-to-setup, low power load, easily adjustable and quiet i.e noise free. After reading such a long list of features, I may also buy a portable AC before setting out for my next long journey. Though its price is expensive yet it has the ability to make our day memorable and trouble free. My sister and her husband are planning a cross-country move soon. Their van’s AC isn’t working and they are worried about getting too hot on the drive. So, it is good to know that there are several different types of a way for them to keep themselves cool that isn’t too expensive. Personally, I think they should just get their van’s AC fixed before leaving.